I haven’t had much time for blogging the past few days. I’ve been pretty busy working and preparing for my trip to Russia. I have been doing a little beading. I’ve been working on a couple of small projects that I can’t post on my blog just yet. I have been thinking about what my next big bead painting should be, but I think I’m going to wait until after my vacation to start that… In the meantime, I thought this week would be a great time to start something a little different – a beaded self portrait! Study for a beaded self portrait. Coloured pencil. 2010. The above sketch is based on a photo I took of myself using Photo Booth. I suppose this is how I look while I’m working on my iMac, especially late at night. In case you didn’t know, I am quite the night owl. I love to stay up late either beading or working on my ‘puter, but at the same time, it bothers me because I haven’t been getting much sleep lately. This is probably due to the fact that my ‘day’ job as a stagehand requires me to stay up until 1 or 2am (or later!) and then be back to work at 8am the next day. When I do have a night off, I find it hard to go to sleep at a normal hour. And, if I do try to go to sleep early, I find myself awake 4 hours later, at which point I get up to either check something on my computer or turn on Porcupine Tree music in an attempt to fall back asleep. It seems to be a vicious cycle these days- one that should be documented in tiny glass seed beads! 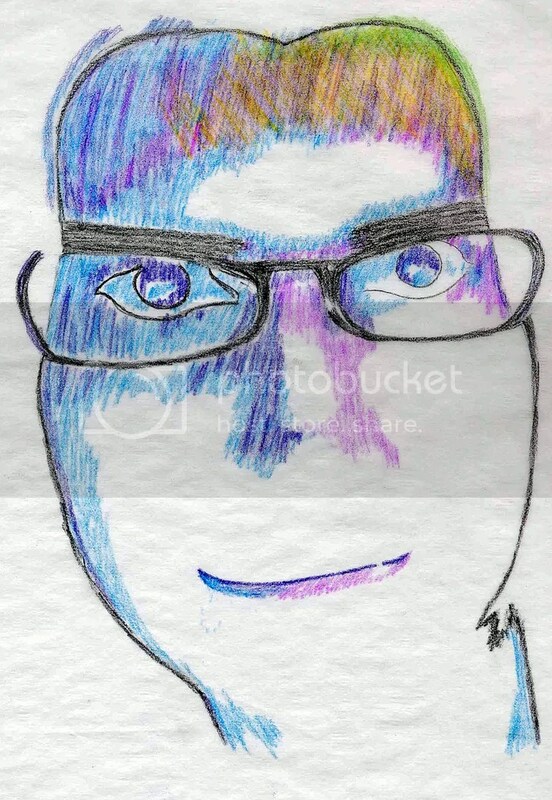 >How colorful – love the drawing! >Wishing you a fabulous trip!